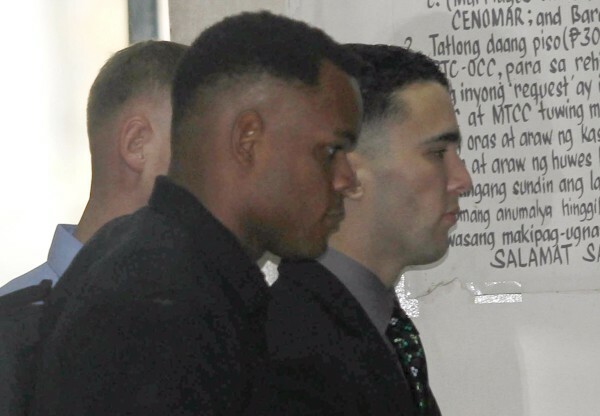 U.S. Marine Joseph Scott Pemberton (right) is escorted by U.S. soldiers as he attends a court hearing in Olongapo, March 23, 2015. MANILA — The Philippine Immigration Bureau has ordered the deportation a U.S. Marine once his trial and possible sentence for the murder of a transgender Filipino woman a year ago are over, a spokeswoman said Tuesday. Lance Cpl. Joseph Scott Pemberton, who is being held at a U.S. facility at an army base in Manila, has been charged with the murder of Jennifer Laude, who was found dead Oct. 11, 2014, in a hotel in Olongapo City, near a former U.S. naval base north of Manila. Elaine Tan, spokeswoman for the immigration bureau, said the U.S. Marine was declared “a risk to public interest for being an undesirable alien” and would be deported once his murder trial and any subsequent jail term were over.